I often wonder if a design trend is a fad or a lasting idea, which brings me to grain sacks. 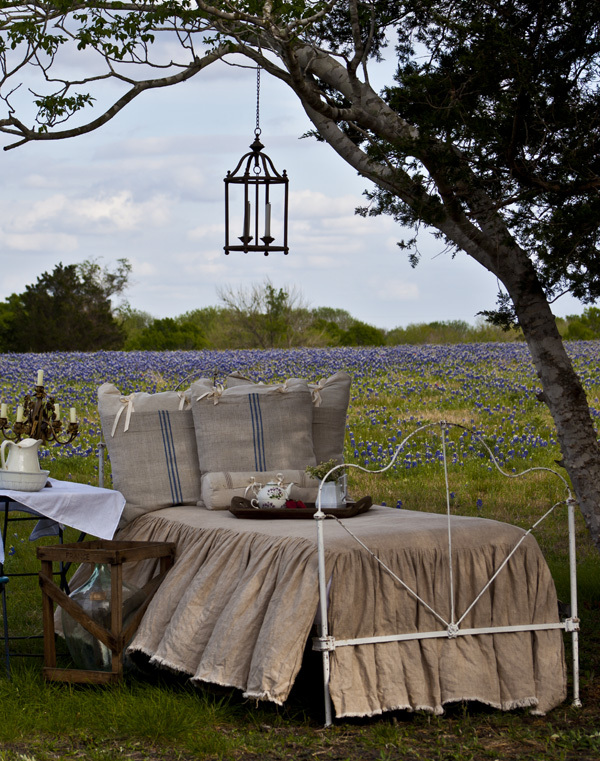 They have been popular now for country decor for many years, and they are here to stay I think. Their popularity may wane, but that old nubby fabric is something you just can’t find in anything brand new. 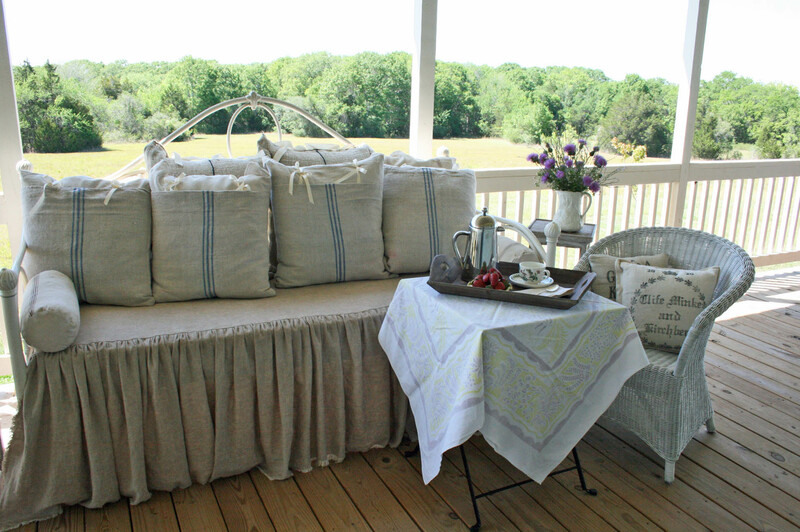 Here are 6 projects using grain sacks. I never thought grain sack cloth could be made so feminine! 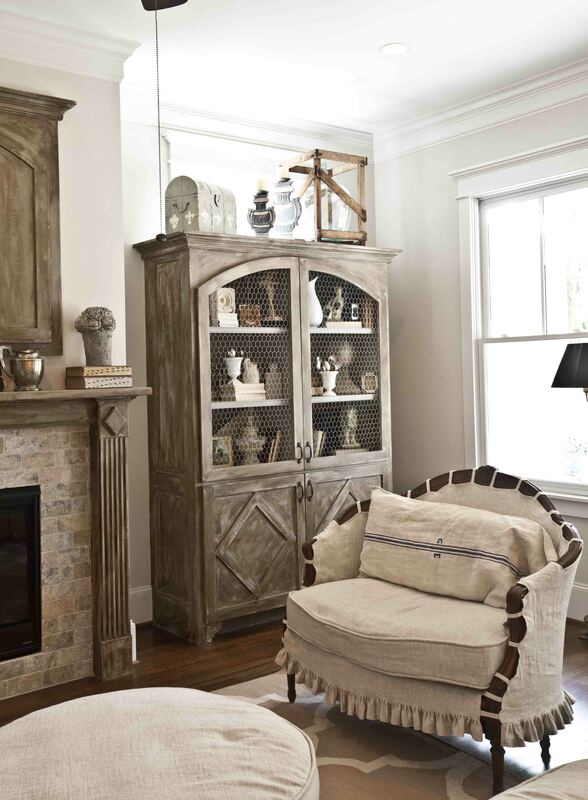 It’s perfect for a farmhouse weathered décor! Does it wash well and need iron? Where do you buy grain sacks new? Any place online or do you have do antique / Goodwill locations? I love everything you do. It is all so timeless! What a wonderful post! I do declare that I can never read one of your posts without pinning myself silly! Thanks for all the inspirational eye candy! Yes, I love grain sacks and use them frequently for table runners or seat covers. 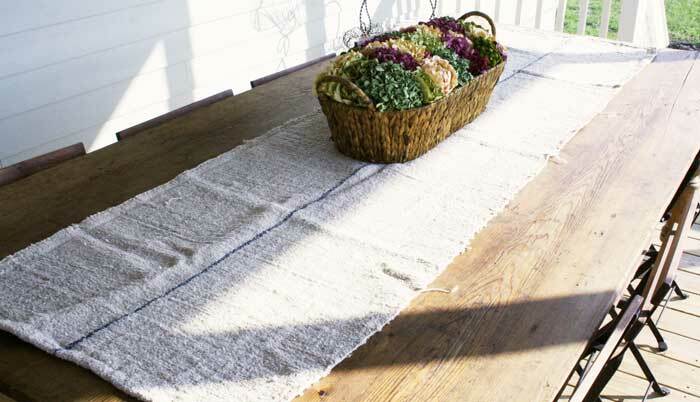 They make an easy table runner of 9-10 feet, by just unstitching the sides of the bags. I’m still amazed by how many people who come into my shop, that are not familiar with them! They go through the was machine on cold, easily and may need a quick iron. Where do I find ALL these grain sacks??????????????????????????????????? Like the ideal but can’t locate the sacks or if I do they are too, too costly!!! I love the grain sack look. I have had two sofas, and four chairs recovered in hemp canvas. This fabric looks like grain sack, however you can buy it by the yard. And it does not cost that much per yard. Go to Hemp Traders and check out this great natural fabric line. To clarify; hemp fabric has been around for a very long time. Indeed, many old grain sacks are made of hemp. The fabric I used is heavy, all natural with lots of texture and character. I have a suggestion for finding authentic grain sacks which are much nicer than the reproduction fabrics. Reproduction fabrics can’t compete with the sturdy vintage ones. There are antique~vintage shops all over the Midwest that have these in stacks. I bought 100 of them at a farm auction in Michigan last summer. A woman came up to me and asked why I would pay 100.00 for 100 grain sacks. She said that she has an antique store and she charges 2.00 for them. (I’m sorry, I had her card, but I no longer have it.) The price I was selling them for in the shop is 8.00 each and I have to tell you that I came up with that price after weeks of stain removing and washing grain sacks. The hard part was that the originals had tiny, tiny little black seeds inside, embedded into the fabric. It was a job. I never sold one of them in the shop. Not one. I finally listed them on eBay in bundles of 10 and I think they sold for 60.00 and 70.00 a bundle. Each bundle went to Japan. So, get a listing of country antique shops in the Midwest and then email them. I think you will find some at good prices. Especially, unwashed sacks. They don’t all have little seeds inside them, but dirty ones need to be soaked and washed after years of reuse. They do come out beautifully. It is wonderful fabric. where do you find these grain sacks? I have yet to see them in a store. 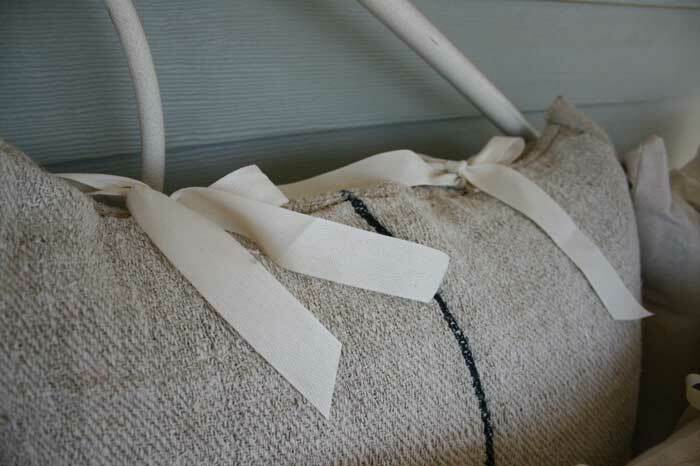 Great project ideas for grain sacks, dear friend! 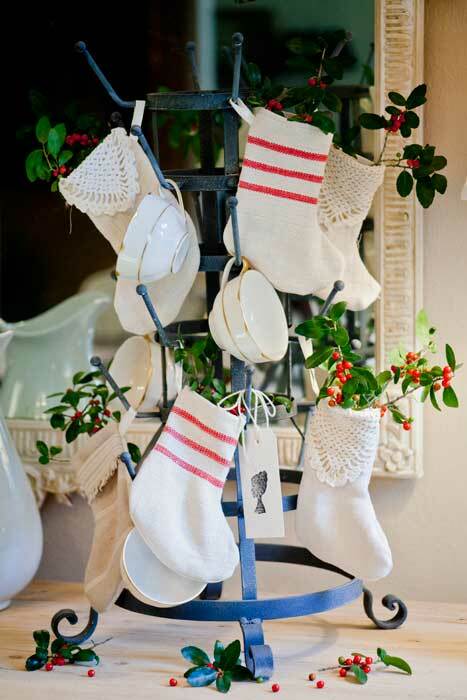 I absolutley adore the mini stockings made from grain sack! I totally agree! I LOVE grain sacks whether they are in “style” or not. I love your posts. 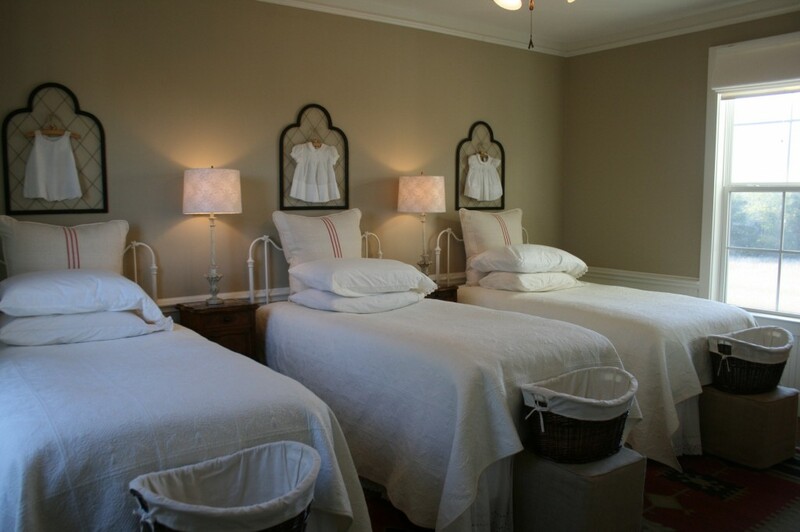 The grain sack pillows are wonderful. I wish I had some grain sacks. I will have to look online and do a little shopping. Thanks so much for sharing. Have a great day. Where do you find the sacks? Nancy I sent you an email. Where do you find the grain sacks? I love evrything you did with them but cant find any or at least not at a price I’m willing to pay. I also would like to find grain sacks? using them for kitchen cabinet doors.